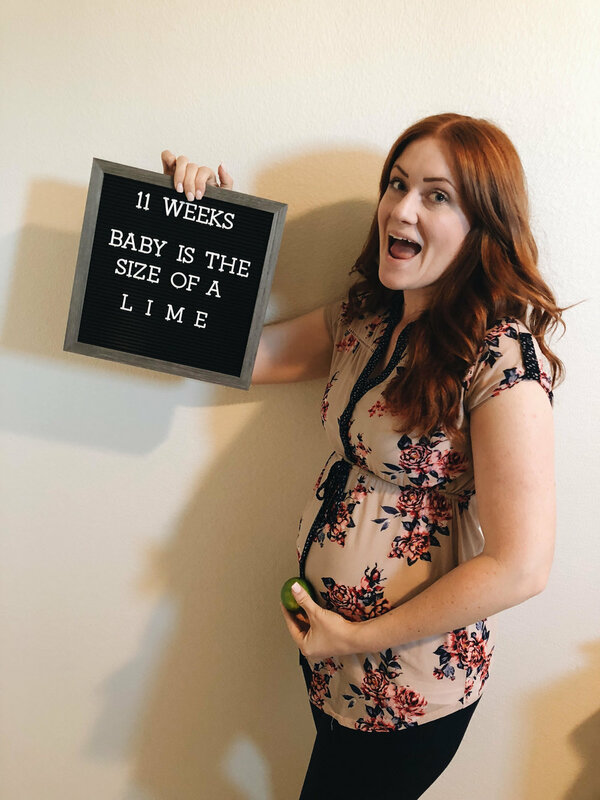 I'm so excited to share with you that I'M PREGNANT! Baby Mize is expected December 30th. There have been so many times where I almost slipped, so I'm so happy it's finally out there! Secrets are hard haha. We found out on a trip up to the mountains. We had been trying, but I honestly had no idea I was pregnant. I mean, there's always the little bit of hope hanging around, but I didn't expect it. I had some other big news on my mind (see below) and was working through adjusting to that, so pregnancy was last on my mind. A good friend of mine, though, encouraged me to take the last pregnancy test I had laying around "just for fun". I thought, "okay fine", and packed it in my suitcase. Immediately after getting home I took another test that we bought on the way home, and was so excited to see the line was even darker. You can barely see the line in the first test we took!! Another odd thing was that I usually get carsick in my husband's car. I have no idea why. But when we arrived at the lodge we were staying at, I realized I hadn't felt sick at all. That stuck out to me. Saturday morning came and I decided to take the test that I packed. I went to the bathroom, set it on the bedside table, and completely forgot about it. I really didn't think it was going to be positive, and frankly, I was tired of seeing negatives. About 10-15 minutes passed before I remembered. I picked it up and started walking to the trash to throw it away. That's when I saw the TINIEST positive line ever. In my head, I had all these ideas about cute ways I would tell Kyle. But because it was so unexpected (and he was right in front of me), I just yelled "KYLE THERE'S A SECOND LINE!!??" Question marks because I was still in absolute disbelief. He barely believed me when I told him! The first trimester was almost split into two halves - the first half I felt gross, the second half I felt really tired. Super hungry the whole time haha. The hardest thing so far has been having to adjust to 2 huge life changes in a matter of a few days. I got diagnosed with Celiac Disease on a Thursday...and found out that I was pregnant on the following Saturday. The "foods to avoid" during pregnancy list isn't THAT huge, but when you also have to avoid a huge amount of food for food allergy reasons, it feels incredibly restrictive. I found myself over-eating quite a bit in the beginning out of a feeling of desperation. I'd be somewhere and be hysterical because I wouldn't see anything that I could eat (thank you hormones). Then when I calmed down and realized that there WERE options, I would be so excited yet so worried that this would be my last meal ever so I'd overeat. A lot of irrational thoughts that I had to work through in the beginning. I had a LOT of meltdowns, being so hungry all of the time but not knowing what the heck I could eat. I definitely think that the first part of my first trimester would have been easier if I had had some time to adjust to having celiac disease first lol. But, c'iest la ve. It's also hard to know if I'm feeling better since eating gluten free because, well, pregnancy. I told my doctor "I think I started getting more energy...but then pregnancy started making me tired. And I'm pretty sure my bloating and constipation started resolving...but then pregnancy." Haha. Our families are both super excited (we are bringing in the first grandbaby on both sides! ), and we had fun sharing the news. Another fun thing has been meeting new patients with due dates close to mine. I started getting excited when I began getting patients with December due dates, and since I get to work with them throughout their pregnancy, I'm looking forward to growing along with them! So that's what I've got for you so far! Thank you so much for sharing in the excitement with us! We are over the moon, and I look forward to sharing more of my experience with you all.